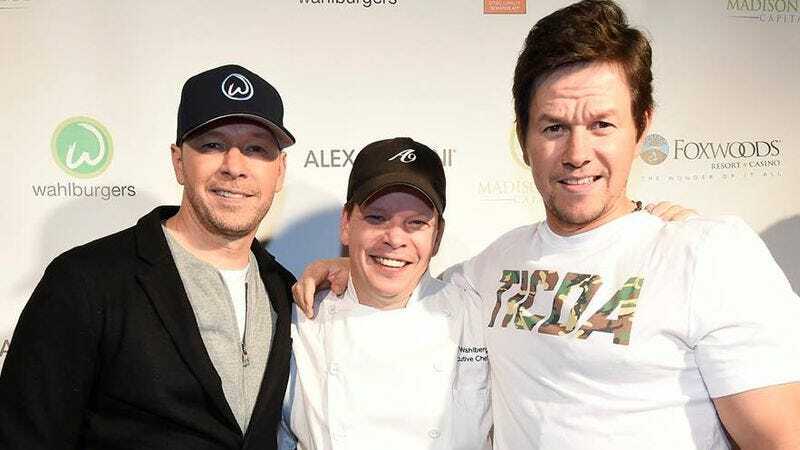 After years of growing up with the full knowledge that their last name naturally lends itself to a burger-related pun, famous brothers Mark and Donnie Wahlberg finally teamed up in 2011 with their less famous, but classically trained chef brother, Paul, to open Wahlburgers. Its first location had humble, mega-celebrity-backed beginnings, located in the Hingham Shipyard near the family’s jointly owned Italian restaurant, Alma Nove. Since then, the brand has grown into a chain with seven restaurants, a reality show, and a very okay 3.5-star rating on Yelp. A few burger shops around the country isn’t enough for those Wahlbergs, though—they want to take the burger world by storm. According to Business Insider, Wahlburgers has signed deals with five different franchise groups to open 30 new restaurants in seven states: Massachusetts, California, Georgia, Michigan, Ohio, North Carolina, and South Carolina. CEO Rick Vanzura said the agreements bring the total number of locations set to open in the next 5-7 years to 118. That should get the company into an even more heated rivalry with fellow better-fast-food-than-regular-fast-food chains like Shake Shack, Five Guys, and Smashburger. Not bad for some nice boys from Boston who look like they’d very much like to introduce your face to their fists.